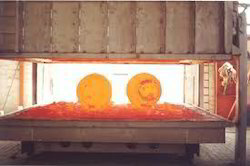 Pioneers in the industry, we offer heat treatment furnace from India. With the aid of our equipped manufacturing unit and experienced team, we are offering an excellent quality range of Heat Treatment Furnace. These products are made to meet the necessities of patrons. Moreover, to keep quality, we employ only quality approved raw material that is bought from reliable vendors of industry. Due to its reliable features, this product is highly praised in the industry.